THESE ARE ALL OHIO HARD PINE WHICH IS BEST for. 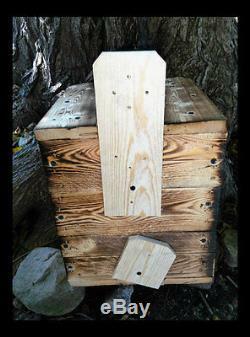 LONG EAR'ED OWLS, Barred owls, and Spotted Owls NESTING BOX OR YOUR CHOICE OF. SAME HOUSE's BUT DIFFERENT SIZE HOLE AND HOLE POSITION. 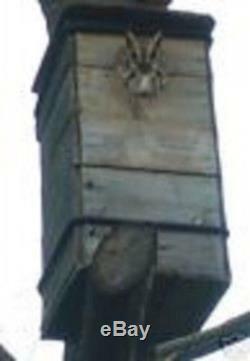 Plus Owl box has long platform on bottom. PICTURED IS ONE IN DALLAS TEXAS BY CUSTOMER. WHOM NAMED THERE OWL CHARLEY. IT TOOK 2 YEARS BUT WITH. PLEASE NOTE: THIS IS OHIO HARD PINE WHICH IS BEST FOR OWLS. REMEMBER THESE ARE ALL QUALITY OHIO HARD PINE. Should last years with min care. These are not the cheap woods, CHIPBOARD, OR Plywood that last 3 to 5 then falls apart. NOR IS IT MADE FROM THE CYPRESS or CEDARS THAT HAVE A PROBLEM OF. RELEASING TO MUCH SCENT OILS AND GASSED THE CHICK's. JUST SMELL OF IT AND THEN REALIZE WHEN WET GIVES OF 4 TIMES AS. AIR O MATIC WOODS ARE REALLY NASTY FOR CRITTER HOUSES. THAT IS WHY WE HAVE EARNED THE HIGHLY PRIZED. OHIO HARD PINE IS A VERY DENSE, HEAVY WOOD THAT IS VERY GOOD INSULATOR. THATS IS WHY EARLY PIONEERS USED IT FOR THERE ROOF SHINGLES. AND SIDING, MANY OF WHICH ARE STILL IN USE TO DAY. LET US KNOW WHICH YOUR AFTER AS HOLE SIZE IS. Designed and built by Holley. PICTURED IS THE OWL HOUSE WITH LONG EAR'ED TAKEN IN DALLAS TEXAS. THE FOLKS NAMED IT CHARLEY. THEY GOT ONE TO COME IN. ITS A SPECIAL GIFT FOR ALL. ROUGH CUT OHIO HARD PINE WOOD & AIR DRIED. From A saw mill TO BUILDER TO YOU. THIS IS A Real QUALITY. (ROUGH CUT WOOD & AIR DRIED) OHIO HARD PINE Directly from the saw mill, BUILDER to you. THIS IS MADE WITH PRIDE TO THE HIGHEST STANDARDS OF EXCELLENT KNOWN OHIO CRAFTMANSHIP. Clean side OUT; old barn wood in to help youngster's climb out with a ladder all so on inside below the hole. Wood style is total air dried. This is the wood Roof shingles are made from IN FRONTIER DAYS AND MANY ARE STILL STANDING. Plus Wood ladder for young to crawl out (Not Screen/Cloth). Screen or Cloth Decays and becomes a Death trap in time. SO WE DO NOT USE IT. ENOUGH FOR UP TO 3 YEARS MATERIAL IF YOU CHANGE EVERY YEAR. PLUS THE MOUNTING BRACKET WITH SCREWS FOR MOUNTING ON Tree. Plus can be Mounted on Bottom, Back, Tree or Post. PLUS INSTRUCTIONS ON HOW AND WHERE TO PUT HOUSE. THE BOXES ARE all IN OHIO HARD PINE (AIR CURED). The main thing to know is that these WORK. & HELPS ELIMINATE MICE, SMALL SNAKES, AND OTHER. This is not a E- LL chepo in construction. These are really neat houses Just Right for LONG EAR'ED OWL'S. We worked hard to get the manufacturing of these just Right. Note the hole for them to enter. Is all so designed so Upper part of house leans out from pole. Or tree farther than the bottom which again makes it easer for young TO CLIMB OUT. Easy access clean out door on side held in with pins for clean out and checking of nest. We started by making houses for the church youth program FOR W O O D D UC KS. Then we found out they work well FOR SMALL OWLS. SAME SIZE JUST MAKE HOLE SIZE DIFFERENT. AND MAKE A LARGER PERCH ON BOTTOM. FOR THE MEDIUM AND LARGER OWLS WE INCREASED THE SIZE FOR THEM. WORKS VERY WELL AS YOU CAN SEE FROM THE PICTURE. For Bottom, Back, Tree, or Steel and Wood Pole. Even if its not our house we will try to help. You all so can mount on steel pole but you need to furnish your own bracket. We furnish bracket for wooden poles. Note on picture that we cut front hole irregular for them. This is the best you can get. Size measurements are as follows. OHIO HARD PINE which is what roof and out side shingles are made from. 10 & 1/2 inches deep. 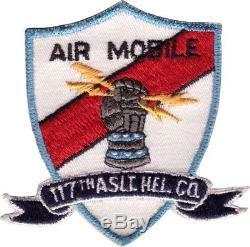 21 & 1/4 inch Height back plate. 1 inch Height bottom clean out door bracket TO KEEP EGGS IN IF CHECKING. 9 1/2 inch X 10 inch inside box. Has Side Panel is removable for cleaning and checking. Comes with mounting screws and instructions. 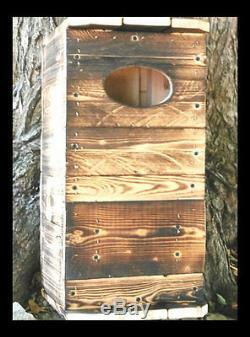 Absolutely beautiful Screech Owl nesting box! Can't wait to get it in a tree! Reply by myron_holley: Thank U. But Truth is that U folks who put these up are the Truely Great ONES. WILL LAST & Last FOR YEARS AND YEARS. These are built by a fellow who takes alot. I mean LOTS OF PRIDE IN HIS WORK. YOU REALLY WILL LOVE THIS. IF YOU HAVE A QUESTION, CALL 330-221 8799 EASTERN ZONE. To see lots more Neat. Stuff put arrow on red tag. Don't Miss the boat on this one. IF YOU NEED MORE THAN ONE WE HAVE THEM LISTED IN MY STORE. VETERANS" is in sale since Tuesday, April 26, 2011. This item is in the category "Home & Garden\Yard, Garden & Outdoor Living\Bird & Wildlife Accessories\Birdhouses". 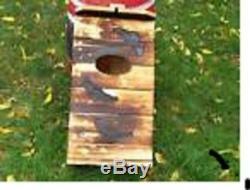 The seller is "myron_holley" and is located in Kent, Ohio. This item can be shipped to United States, Canada, United Kingdom, Denmark, Romania, Slovakia, Bulgaria, Czech republic, Finland, Hungary, Latvia, Lithuania, Malta, Estonia, Australia, Greece, Portugal, Cyprus, Slovenia, Japan, China, Sweden, South Korea, Indonesia, Taiwan, South africa, Thailand, Belgium, France, Hong Kong, Ireland, Netherlands, Poland, Spain, Italy, Germany, Austria, Russian federation, Israel, Mexico, New Zealand, Philippines, Singapore, Switzerland, Norway, Saudi arabia, Ukraine, United arab emirates, Qatar, Kuwait, Bahrain, Croatia, Malaysia, Brazil, Chile, Colombia, Costa rica, Panama, Trinidad and tobago, Guatemala, Honduras, Jamaica, Antigua and barbuda, Aruba, Belize, Dominica, Grenada, Saint kitts and nevis, Saint lucia, Montserrat, Turks and caicos islands, Barbados, Bangladesh, Bermuda, Brunei darussalam, Bolivia, Ecuador, Egypt, French guiana, Guernsey, Gibraltar, Guadeloupe, Iceland, Jersey, Jordan, Cambodia, Cayman islands, Liechtenstein, Sri lanka, Luxembourg, Monaco, Macao, Martinique, Maldives, Nicaragua, Oman, Peru, Pakistan, Paraguay, Reunion.